Here is a vegan entree I have been making for years and years. 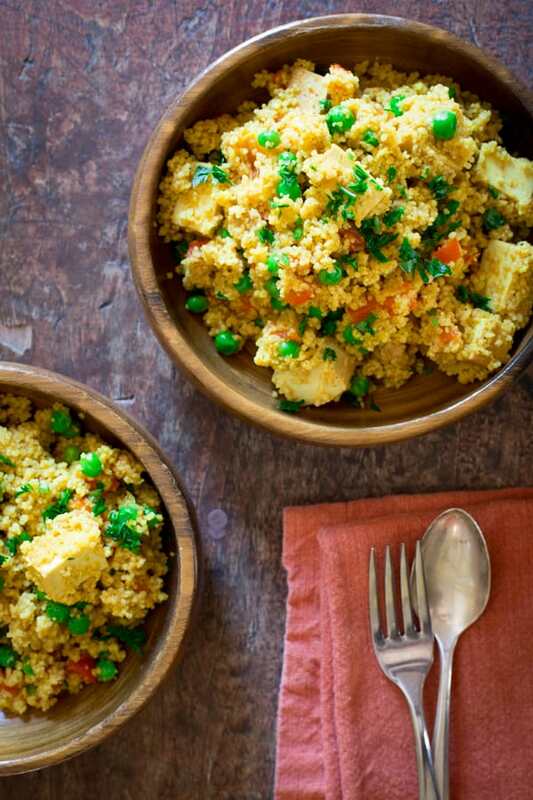 It is made with curried whole-wheat couscous, roasted red pepper, peas and baked tofu. I have wanted to share this recipe with you all. For! Ever! 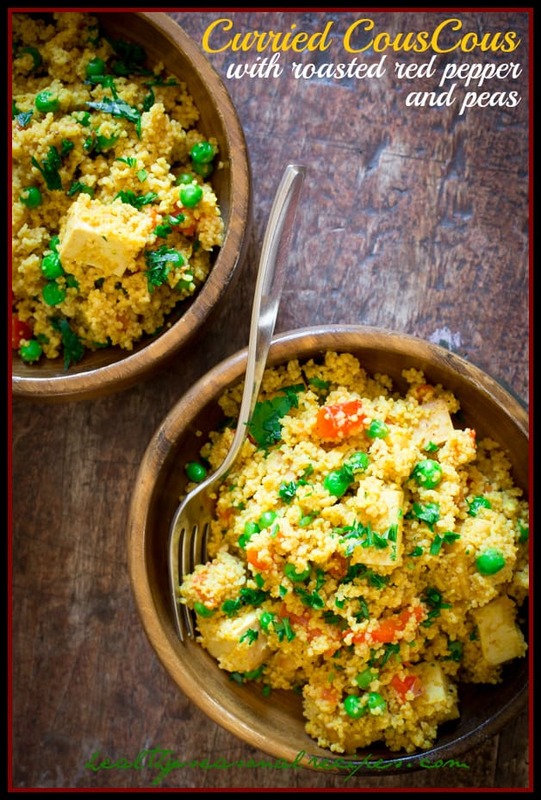 I have been making this curried couscous with roasted red peppers and peas since I was 20. It is so easy and so yummy, and it goes really well with all sorts of things. It is always satisfying hot or cold. We eat it as a main course, though it is also great as a side dish or for a potluck. My roommate in college, Abby made it for me the first time I had it. We were spending the summer out in Colorado in Steamboat Springs. She was a horseback guide at a dude ranch and I was a prep cook at a pub in town. We didn’t have much cash. And that which we did have was spent on fine Colorado beverages. So to save money I ate meatless most of the time. I remember the evening she made this. Our little apartment filled first with the wonderful roasty smell of the broiling red bell pepper. And then the garam masala hit. I had never had it before, and it was a revelation. I remember being so shocked by how flavorful it was. I now know that the broth was also key to building the flavor. I have made it again and again. Once whole-grain couscous became readily available I switched to using that. I also use chicken broth if I don’t have vegetable broth. It is all good. But it almost always has roasted red peppers and peas. Sometimes I will add in raisins, currants or nuts. I even did a variation of it for a potluck story I did for Parents magazine. It is great for an easy potluck recipe because it good hot or cold. It goes without saying that it is a perfect vegetarian main course. Today I added in baked tofu for a bit of protein. Or omit the tofu if you want, and if you eat meat I think it is incredible along side grilled lamb. Please note that the type of curry powder you choose will really change the nature of the recipe. I used Teeny Tiny Spice Co. British Curry. Though as I mentioned it is amazizzle with Garam Masala too. Or choose a hotter curry and your metabolism will thank you. Arrange oven rack in upper third of the oven and set to broil. Place pepper on a broiler pan and broil, turning occasionally until the skin is charred and blistered all over, 12-17 minutes. Place pepper in a bowl and cover with foil or a plate to allow the pepper to steam and cool, about 10 minutes. Peel charred skin off pepper. Core, seed and chop pepper. Heat oil in a medium saucepan. Add garlic and curry or garam masala and cook, stirring until fragrant 30 to 90 seconds. Add broth, cover and bring to a boil. Add couscous, tofu, peas and the roasted red pepper and return to a simmer. Cover and remove from the heat. Let sit 5 minutes before fluffing with a fork. Serve sprinkled with parsley if desired. I say give it a try, and you can always leave it out if you aren’t sure still. I grew up eating it. My mom was a really adventurous cook, so it never occurred to me to dislike it. What a simple and delightful recipe! I can’t wait to make this! It’s so special too..I’m sure there are so many memories associated with this dish. I shall def go for the hotter curry ;). I’m Korean and spicy food is my life hehe. Yes go hot with this one. I love firey food too! Katie, this sounds soooo good, and the photos (as always) are stunning! The lighting, the color–LOVE! This looks amazing. Do you think quinoa would work with this recipe? I love couscous but I try to avoid it due to the gluten. The recipe calls for a 7.6 oz box of couscous, but I noticed that I bought a 17.6 oz box of couscous. Is your recipe correct or is there a typo? Just want to make sure before I start telling others about the recipe and/or try it myself. Looks delicious! Thank you for checking Kira. It is hard to read the way the font is here, but I meant a 7.6 ounce box. The brand I used is Nile Spice. I checked their website, which is a little confusing to me, and I believe it is about 1 1/3 cup dry couscous. Or you can weigh yours out on a digital scale if you have one. Hope you enjoy it! 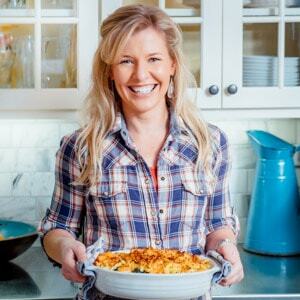 Katie, I love this recipe. I’m not a fan of tofu … so I just roasted some cauliflower in the oven and used that instead … it was delicious ! Where do you find baked tofu? Is it a product sold I stores or do you bake your own? I LOVE tofu!! Baked tofu is available pre-made and is available in the refrigerated section with other tofu. I’d like to bake my own tofu for this recipe (as I’ve got some regular tofu I’d like to use up). 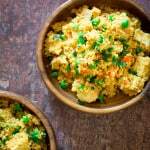 Know of any decent baked tofu recipes? I don’t really, sorry to say. There’s one in my cookbook, but I am not sure of one online. 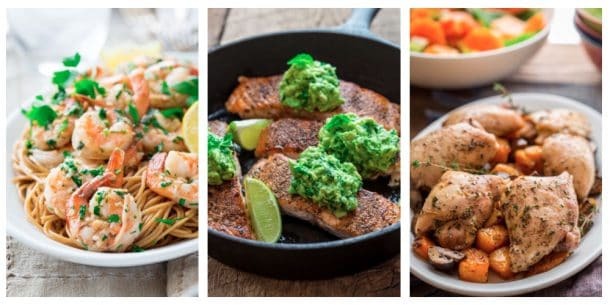 This one from the kitchn looks decent to me but I haven’t tried it myself. Let me know how it goes!